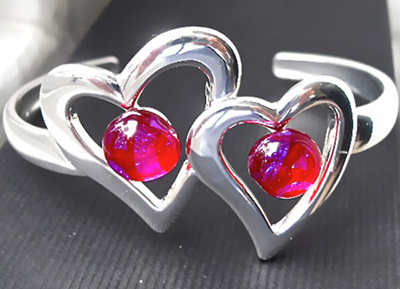 The larger heart measures 2.7cm x 2.7cm and the smaller one is 2.4cm x 2.4cm. The glass pieces are 1cm x 1cm approx. and are made of two layers of glass. A layer of Deep Pink/Purple patterned Dichroic glass topped with a layer of clear glass. The bangle is 0.6cm broad and is made of very good quality plated silver and is adjustable so will fit most wrists. It comes in a Silver card bangle gift box.